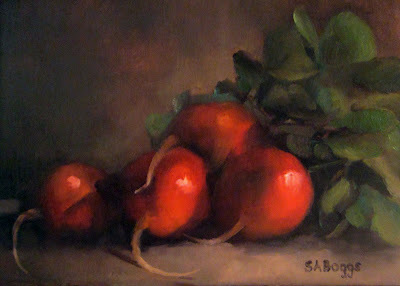 The subject is a bunch of four radishes. I was really taken by the reds, and the strange stems that curl from the bottoms. This is the first time that I have painted them and it made for an interesting day. The colors remind me of Christmas, but as I was painting I kept thinking that this would make an interesting painting for someone's kitchen or dining room. Fun painting to do. I hope that you enjoy them too. You have a very soft touch with your brush. It's very traditional but yet modern:-) I really love the brushwork with this one. Thank you so much for sharing your gift with the world. Keep painting!! !